Breakfast on a Saturday. Sure, why not? I was up early. Really early for me. Before 9:00. Even on days I work, that’s rare. Last night, I was finally burning off all the sticks and tree branches that fell during the ice storm in February and something about lighting a fire made me want a beer. Four beers later, I realized at some point, I became a lightweight. I was in bed by 10:30. J usually gets up around 8:00 on weekends just because her body is used to the wacky schedule she works. When I stumbled out of the bedroom around 8:30, she started talking about breakfast and the Farmers’ Market. Since the market was in our plans, I figured we should head downtown for breakfast. 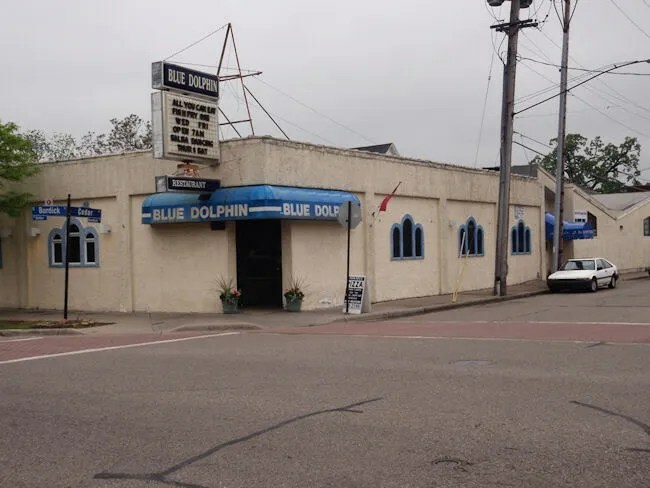 The place downtown that we still haven’t eaten at was The Blue Dolphin. Everytime we pass the place, we both say we need to go there, but neither of us ever think about it unless we’re within a block of the place. The Blue Dolphin is on the corner of Burdick and Cedar Street about a block south of where Kalamazoo Mall becomes Burdick again. It’s a pretty plain, old building with an older marquee attached to the roof that lists specials and upcoming events. J and I have lived in several different cities around the country since we graduated college almost ten years ago. Whenever we’re looking for a place to eat in a new city, we always look to see where the local police department is eating. Police officers and firemen always know the best, quick, cheap places in town. When we pulled up to the Blue Dolphin, there were two KDPS cars parked out front. We knew we were in the right place. We passed the aforementioned KDPS officers on our way in who held the doors for us as we made our way to the cash register/hostess station. A man came from the back of the restaurant and grabbed a couple menus then took us to a table in the lower dining room. The space is a split level dining room with the typical Greek restaurant decor. The color scheme is blue and white and there are pictures of the Greek Isles on the walls. As we sat down and started looking at the menu, J mentioned how she loves going to Greek diners. Since her and I have been together, I don’t think we’ve ever struck out at one. They’re always pretty cheap and you always know what you’re going to get. The Blue Dolphin is no different. Our waitress started with our drinks. I got a Coke. J got a glass of orange juice. The Blue Dolphin actually serves breakfast all day, but for once, we were in a breakfast joint while it was still technically breakfast time. 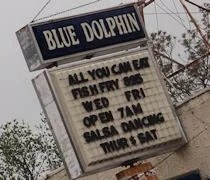 The thing that made me want to go to Blue Dolphin was their fairly cheap steak and eggs. I got the Sizzler Steak with 2 eggs, American fries, and toast. Of course, the first thing I went for was the steak. It was a pretty thin piece of meat that was cooked well done. 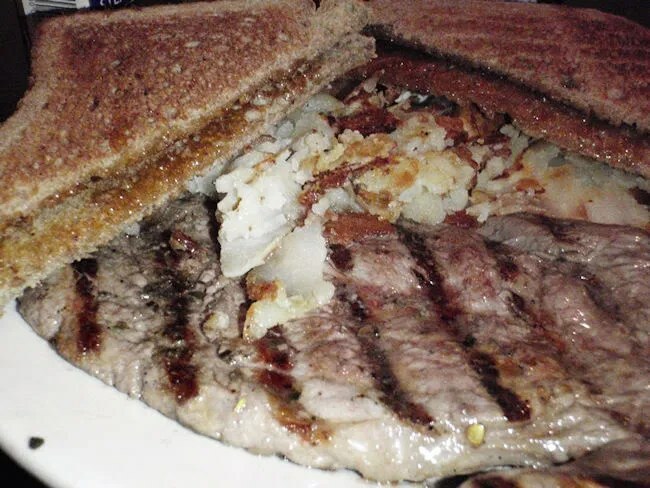 Like you would expect, it wasn’t a filet mignon or any sort of good cut of meat, but it had that great salty, greasy taste you can only get from a diner griddle. The eggs I had cooked medium and they were just barely out of the runny stage. They were actually cooked exactly the way I like my eggs. The toast was wheat toast with a light spread of butter. The funny thing about the toast is J and I just had a discussion about how much butter should be on toast. She asked me to make her some the other night and when I did, she said I put too much butter on. Didn’t know that was possible. The toast we got this morning at the Blue Dolphin was exactly how she likes it. J was really craving bacon so she ordered the 2 eggs, American fries, toast, and bacon. When her plate was brought out, it was missing the bacon, but, after checking with the kitchen, our waitress brought out a plate with five pieces. J likes her bacon really crispy and this bacon was a little on the rubbery side so she gave me a few pieces. She cut up three slices of the bacon and mixed it in with her scrambled eggs. 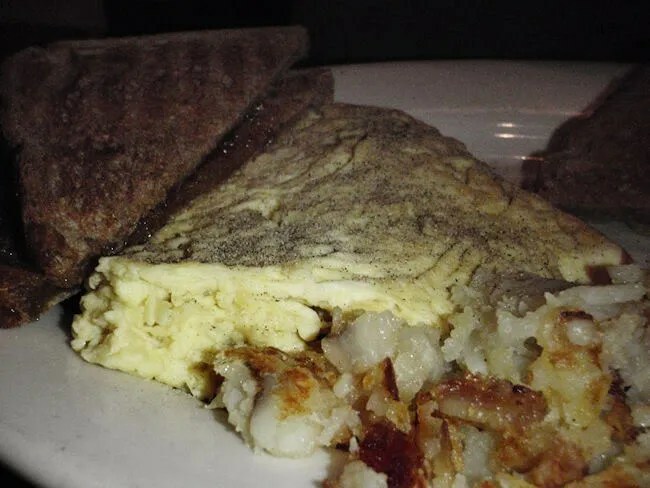 At first, she was kind of in the mood for a bacon and cheese omelet but didn’t see it on the menu, so she sort of made her own with the scrambled eggs. The American fries seemed to be done the way she likes them as well. Nice and crispy. Our bill was a little under $15. We picked Blue Dolphin because we assumed it would be a cheap yet hearty meal. That’s exactly what it turned out to be.